I have wanted to fish New Zealand for a long time. It was one of those places on my list, if you know what I mean. I have heard stories about the beautiful brown and rainbow trout, the crystal clear rivers, big mountains, and friendly people. This last week on the South Island exceeded all of my expectations. South Island New Zealand was the first stop in an incredible adventure that my good friend Dan Vogel and I are still in the middle of. We arrived via air to Queenstown, and took the bus up to Cromwell where we met up with our guide, Ronan Creane of Ronan’s Fishing Missions, for a week long road trip. Ronan grew up in Ireland fishing for sea trout, Atlantic salmon, and trout in rivers and lakes. In 2002 he started exploring New Zealand trout rivers and today he is a full time fishing guide on the South Island. I have always felt that the guide makes the difference between a good and a great trip and Ronan was phenomenal, getting us on the fish, arranging a number of critical local details, and also making us feel right at home. He certainly made the trip very special for Dan and me. In a week of fishing, we only scratched the surface of fishing in New Zealand, but we did get to sample a wide variety of waters. We fished lakes, backwaters, spring creeks, and rivers. We did a lot of sight fishing, which NZ is known for, but did some blind casting too. We took fish on dries, nymphs, and streamers. All of these techniques proved to work in certain situations. I have always loved walking and looking for targets (fish) and NZ offers a ton of this type of water. We fished both backcountry waters and more road accessible places as well. It turns out that not every fishery is a 10 mile hike, and Ronan shared with us a few “secrets” that were hidden in plain sight, allowing us to spend a lot of time fishing on days where walking into spots wasn’t the order of business. We also were treated to a couple of helicopter rides deep into the wilderness, which was a new experience for Dan and I. Something that really stood out was that big fish were willing to hold in very visible places, completely exposed. Matt, who fished NZ a few years ago, had “warned” me of this, but it still came as a bit of a surprise. The first time I saw a 5-pound brown trout sitting in a foot of crystal clear water over sand, on a sunny day, swinging gently to pick off drifting nymphs, I had to readjust my entire way of thinking about trout. The lack of predators in New Zealand means very large trout will be very comfortable holding out in the open. This is important for anglers to know because it helps you understand where to look as you scan the water for a target. In Montana and Argentina birds of prey like osprey, king fishers, eagles make large fish take much different lies. The fish, brown and rainbow trout, were gorgeous and very well conditioned – spectacular, really. I was very impressed by the average size. Trout from 3-6 pounds and 20-24 inches are what we saw during our trip. There are certainly larger (and smaller) fish about, as well. I will definitely visit New Zealand again as it is a beautifully unique place to fish for trout. 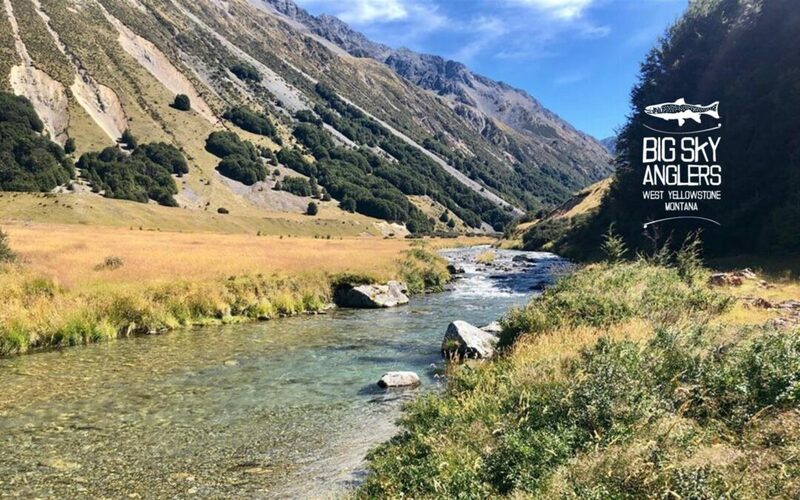 For those interested in doing a road trip that takes you to mountain rivers and lakes with a very fishy competent guide I highly recommend you contact Ronan, or give us a shoult and we’d be happy to get you in touch with him and help you sort out the details of a trip to the South Island! PS – It turns out that fly fishing is indeed a small world. Over a decade ago I met some guys named Paul Arden, founder of Sexyloops.com, and Stu Tripney, of Stu’s flies. They were in West Yellowstone hanging out and fishing and they were the ones that first told me stories about New Zealand and its fish, and planted the seed in my brain to go there one day. Finding myself all these years later hanging out with Ronan, who it turns out is a close friend of theirs, was a real surprise, and goes to show you that some trips are just meant to be. As we talked, it became more and more clear that there was a great community connection that centered around Sexyloops.com that was bringing together some incredibly fishy and wonderful people. BSA’s own Matt Klara has been a contributor on Sexyloops over the last 12 years, alongside, you guessed it, Ronan.